After circulating various game portals throughout the internet for the past four months, Airport Madness 2 has finally hit Facebook. It is my intention to make the game a more social experience, beginning with the ability to challenge Facebook friends and compare your high scores. A game is always more fun when you can do it with your friends. In fact, I believe the Airport Madness concept is begging for “multiplayer”, and Facebook is the perfect platform. It would be a tremendous undertaking to promise something like multiplayer for Airport Madness 3, due in early 2010, but it is definitely worth it for me to look at. Please, keep sending me your ideas. In an effort to circulate Airport Madness, I have developed a kind of Facebook Fan Club. Since you are reading this, I hope that you will join by clicking the Facebook link below. I hope to see you all on Facebook soon! This entry was posted in Airport Madness 2, facebook on August 28, 2009 by admin. I am making initial plans for an Airport Madness 3. I do not offer a release date, but I am thinking somewhere around January 2010 (give or take 3 months). My goal is to make Airport Madness 3 similar in concept to the first 2 games, but a vast improvement. The free version will be the usual teaser, but the full version will be a full-screen game creating much more involvement with the airborne aircraft (i.e. assigning turns, holds, different runways). A much larger screen for the “full version”. Airport vehicles, cars, boats, birds. Special operations, such as training aircraft and balloons. If you have any suggestions please email me. This entry was posted in airport madness 3 on August 6, 2009 by admin. Aircraft occasionally do not hold short of their departure runway. Aside from fixing the minor glitches, I do not plan to add anything further to Airport Madness 2. If you have any suggested additions for the game, I will keep them in mind for Airport Madness 3 which will release at a future date. This entry was posted in Airport Madness 2 on August 6, 2009 by admin. Sky Madness is now available, with both free and full versions to suit everyone’s budget. I believe Airport Madness fans will really enjoy this. The screenshot is from the full version. 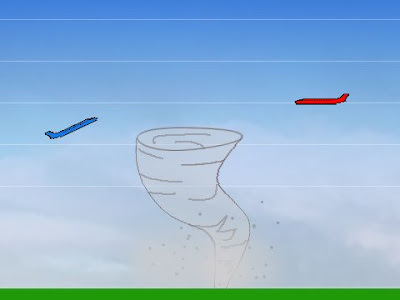 Yes, the full version has tornadoes. The full version also has bad weather, numerous objects that need to be avoided, plus a continuous-play feature, similar to that seen in Airport Madness 2. For just $6.99 it’s a bargain. I sincerely hope you enjoy my latest creation, Sky Madness. As always, I appreciate feedback, so don’t hesitate to shoot me an email. This entry was posted in Sky Madness on August 2, 2009 by admin.